The retina is a thin sheet of nerve tissue lining the back of the eye. Light rays are focused on the retina and are then transformed into nerve impulses and transmitted to the brain for visual processing. Blood vessels supply the retina with oxygen and other nutrients. Arteries deliver blood from the heart and lungs, and veins return “used” blood from the retina back to the heart for replenishment. Blockage of either arteries or veins results in a vascular occlusion, preventing adequate blood flow to the retina. Blocked circulation may lead to bleeding, swelling, growth of abnormal blood vessels, partial or total vision loss, and even cell death. Blockage of the main central vein of the retina results in a central retinal vein occlusion (CRVO.) A branch retinal vein occlusion (BRVO) occurs when smaller branches of the central vein are affected. Both conditions occur most often in patients over the age of 50. Risk factors include high blood pressure, high cholesterol and lipids, diabetes, glaucoma, and more unusually, blood clotting and inflammatory disorders. Blurred vision is the most common symptom of retinal vein occlusion. Swelling and bleeding within the macula, as well as ischemia (loss of blood supply), may lead to mild to severe vision loss. Profound loss of vision may be related to the development of neovascularization, or abnormal blood vessel and scar tissue growth, resulting in frank hemorrhage within the vitreous cavity of the eye. Neovascular glaucoma is an unusual complication of CRVO leading to excessively high pressure within the eye. Dr. Cohen and Dr. Kanter employ a wide range of retinal imaging techniques, including fluorescein angiography, optical coherence tomography, and ocular ultrasound to determine an appropriate course of treatment. Treatment of retinal vein occlusions may include laser surgery, vitrectomy surgery, and injection of pharmacotherapeutic agents directly into the eye, and in many cases, simple observation. Careful evaluation and systemic workup may identify medical risk factors that may need to be managed by the patient’s internist. Color photograph and OCT image of a patient with a central retinal vein occlusion demonstrating massive intraretinal and subretinal swelling of the macula. Complete resolution of retinal swelling in the same eye following serial injections of Eylea. 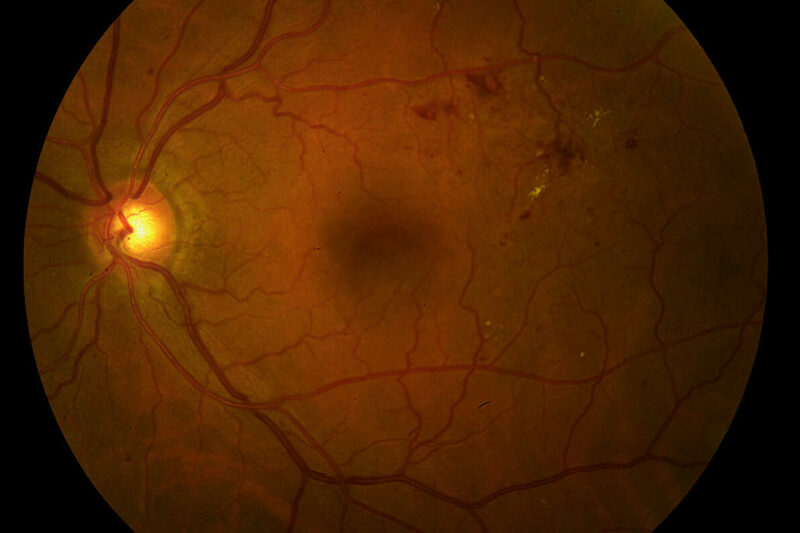 Branch and central retinal artery occlusions may occur when small bits of cholesterol or fibrin (emboli) are dislodged from the carotid artery, a major artery that supplies blood to the brain and eyes, and become trapped within the retinal arteries. Immediate blockage of blood flow to the retina results in profound loss of vision. High blood pressure and hardening of the arteries are major risk factors. Other causes of artery occlusion include cardiac valvular disease. Echocardiography and carotid artery ultrasound may be ordered by your physician to investigate a source of potential embolization. Anti-platelet and anticoagulation therapy may be advised to reduce the chance for recurrent blockage of blood vessels.